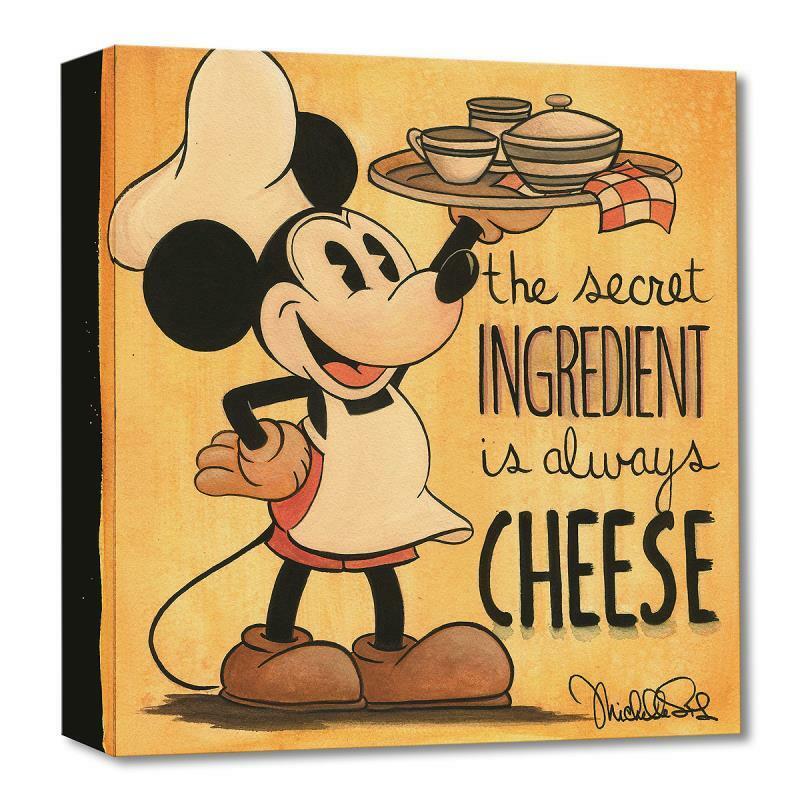 "The Secret Ingredient" Limited edition gallery wrapped canvas by Michelle St. Laurent from the Disney Treasures collection. 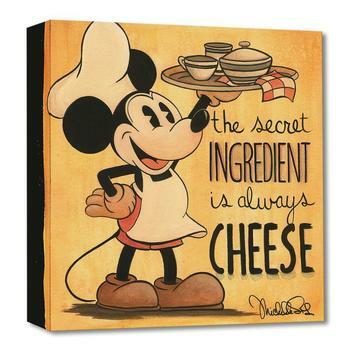 "The Secret Ingredient" is a limited edition giclee on canvas by Michelle St. Laurent featuring Mickey Mouse imagery. Part of the Disney Treasures collection from Disney Fine Art, this piece comes gallery wrapped and ready to hang. It is also accompanied by a certificate of authenticity. The edition is limited to 1500 pieces. Item measures approximately 14" x 14". Michelle St.Laurent was born and raised in New Jersey, the oldest of four children in a large Italian family. At a young age, Michelle was inspired by Italian Renaissance painters Michelangelo and Leonardo da Vinci. She began painting at the age of 6 and asked for a new paint set on every birthday. In the first grade she entered a poster contest creating a painting of all the Disney characters marching in a parade. The judges disqualified her because they could not believe she had done the painting by herself without tracing. Her disappointment fueled her determination to become an artist. Filling many sketchbooks by the age of ten, Michelle began working with pastels drawing portraits of singers and movie stars. She won first place in a local art show and her piece was displayed in the town’s City Hall. 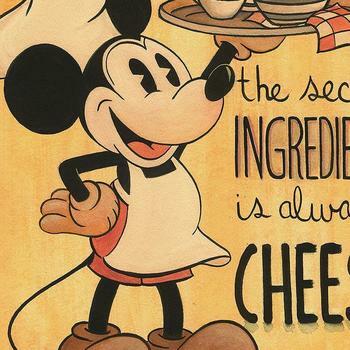 After gathering years of experience, Michelle was hired by Disney Design Group where she has spent the last ten years creating artwork for Disney’s Theme Park Merchandise and special events. She trained, worked and was inspired by Disney legend Ralph Kent for the first 6 years. Michelle began painting for the Disney Galleries in 1998, and became a true Disney artist. Her talent evolved with each piece. "Through my paintings I aspire to recreate the classic Disney magic, which allows each of us to be a kid again.” Michelle’s work has been featured at Disney’s Festival of the Masters, Epcot’s Food and Wine Festival, Magic Kingdom’s 999 Happy Haunts Event, Disneyana Conventions and Disney Cruise Line. Michelle now lives in Florida with her husband and daughter, where she spends time painting on their front porch. Her art feeds her life’s passion and her family fuels her passion for life.